1. Expressed at length, many times, and in many words: "Betty received profuse apologies when her friend forgot to call her on the phone on her birthday." 2. Giving something freely and lavishly or extravagantly: "Mike and Marjory were profuse in their thanks for the emergency loan from their parents." 3. Occurring or appearing in large amounts: "There was profuse sweating during the hot and muggy summer day." 4. Etymology: from Latin profusus, "spread out, lavish, extravagant"; literally, "poured forth" from profundere, "to pour forth"; from pro-, "forth" + fundere, "to pour". In great quantity or abundance: "Ingrid was bleeding profusely when she was brought to the hospital." That which is extremely abundant. 1. An ancestor from the past who is related to someone who is living now: Adam is Eve's progenitor or her great grandfather. 2. 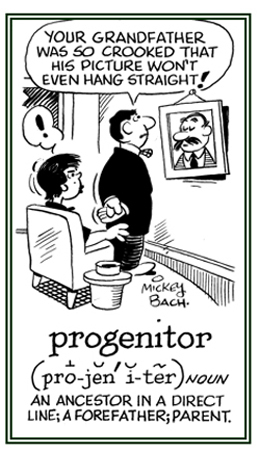 Etymology: from Latin progenitor, "ancestor" from pro-, "forth" + gignere, "to produce, to beget." © ALL rights are reserved. 1. Someone who is born of, begotten by, or derived from another person or parents: Many Americans are the progenies of immigrants. 2. 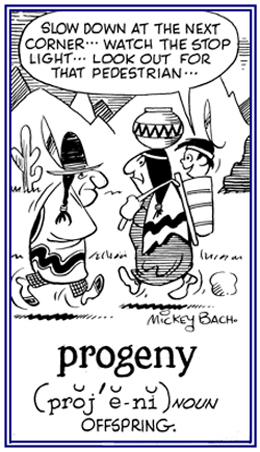 Etymology: from Latin progignere, "to beget" from progenies, "descent, offspring" from pro-, "before, ahead, earlier than" + gignere, "to bring forth." © ALL rights are reserved. 1. Premature appearance of old age. 2. A fatal disease of children characterized by symptoms usually associated with senility. 3. A rare abnormality marked by premature aging (gray hair, wrinkled skin, and stooped posture) in a child. 4. Accelerated aging syndrome in which most of the characteristic stages of human senescence are compressed into less than a decade. 5. 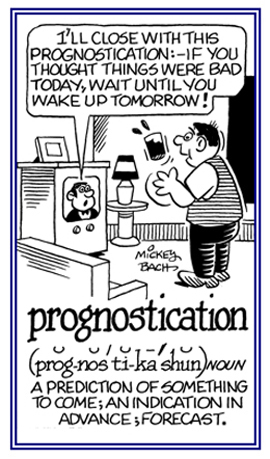 Etymology: derived from pro-, "before" plus the Greek word for "old age", geras; literally, "aged forward". 1. Having jaws that project forward to a significant degree. 2. Jaws that project beyond the upper part of the face; opposed to orthognathous. 1. A medical doctor's forecast as to the probable outcome of an attack or disease as indicated by the nature and symptoms of the patient: Right now Karl's doctor says his prognosis is good. 2. A prediction about how a given situation will develop: For some people there is an optimistic prognosis about the economic recovery. 3. 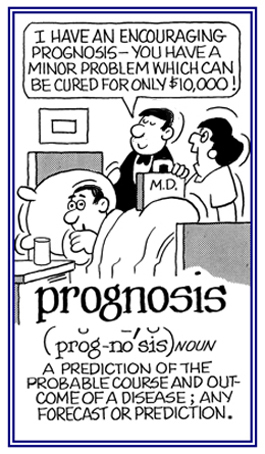 Etymology: from Greek prognosis from Latin prognosis from progignoskein, "to come to know beforehand" from pro-, "before" + gignoskein "to come to know." © ALL rights are reserved. 1. Relating to or acting as a prediction. 2. A forecast or prediction. 3. An omen or portent; a sign. 4. A sign of a future happening; a portent. 1. A statement about what is going to happen in the future: The prognostications presented on TV about economic conditions are usually correct, but not always. 2. 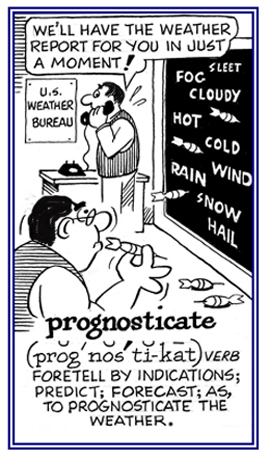 Etymology: from Latin prognosticationem from prognosticare "to foretell." © ALL rights are reserved. 1. A moving forward or onward in time: "It became warmer as the day progressed." 2. To advance toward perfection or to a higher or better condition or situation: "The renovation of the kitchen has progressed very well and we are completely satisfied with the results." 3. To bring something closer to completion: "The work is progressing and it should be done today." "We need to continue to progress back to our hotel before it gets too late." To refuse to permit something to be done or to forbid by law or by an order.